Nutkin has come to stay with me for the summer to get a bit of an education. He is just four and had done very little before he arrived. Keysoe was his first big adventure away from our yard. I had spent the last few weeks gradually building up his fitness and strength, whilst also starting to teach him what some of the obstacles are. The weather leading up to Keysoe was glorious. Lots of sunshine and baking temperatures. On Friday I went over to help the team set up the PTV course in the heat of the day. It was a lovely long course, with a couple of rather challenging questions for a baby, but nothing too horrid. Anyway, having built the course it was time to head home and pack up the car with all the stuff that is required to be a treccie and check that my TREC kit still had everything in that was needed as it seems like ages since I last competed. Saturday morning, I had a relatively leisurely start – the joys of a local TREC – and a late start time. Our TREC partners – Linda Taylor and Bally, arrived at 9.30 and after a brief pause Nutkin agreed to join Bally in the trailer and we were ready to head off. 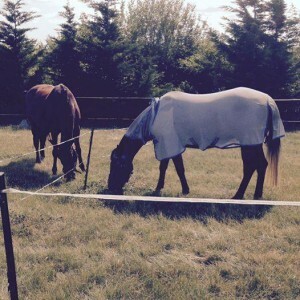 When we arrived we unloaded both horses and put them out in their corrals. Nutkin seemed completely unphased by the lorry park and corralling field, taking everything in his stride. Linda and I faffed for a couple of hours and then it was time for us to get ready to head off for our POR. We applied sunblock and checked we had enough water as the temperatures were still fairly hot. I checked Linda had her glasses as we proved last time we competed that entering the map room without glasses, when you can’t see, is next to useless! Tack check done, all items present and correct. Mary Weston, Nutkin’s owner, was manning the Map Room so she popped out to say hi to him before we started. We nearly made an efficient departure from the start, but discovered that the last person to ride Bally had not readjusted her stirrups, so they were way too long, so all through the first field Linda was struggling to sort her stirrups whilst I heckled, no wonder we got the first ticket wrong, we were just not paying attention. Anyway, we just about got our acts together by the time we left the venue and pottered off on the route. The first section was a 7.5 kmph section, so with all our mucking about with stirrups we were a little down on time so had to get a wriggle on to catch up. We came to the sneaky pair of bridle paths early on the course and as expected found our first ticket. Nutkin stood perfectly to allow me to stamp the ticket. We had a lovely ride finding various checkpoints and tickets en route. However, at about the halfway point Nutkin’s battery started to flash low, the trotting early on and the combination of new experiences was starting to catch up with him and he started to get slower and slower, so all timings went out the window and we just had to ease him home. Most of the way he was happy to sit in behind Bally and let her lead the way. He was, however, brave enough to lead Bally (18 years his senior) through the scary gate and past the killer Shetlands. He didn’t put a foot wrong on the whole ride, so I was really pleased with him. On Sunday he looked fresh and ready for his next adventure. However, as a Level 1 he was not due to compete until towards the end of the afternoon. Whilst he munched his grass and hay I headed of to help judge the Level 2s. I had a lovely spot judging the Maypole with a good view of the whole of the beginning of the course. The level 2s had mixed success with the Maypole, which meant I got to use a whole range of marks, even giving out one 10 for a lovely canter effort. 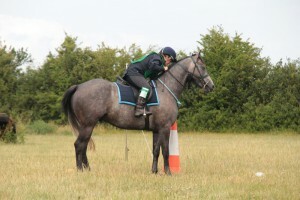 When it came time for our turn on the PTV on Sunday, Bally was due to head out first, with a 45 minute gap to Nutkin. We brought them in and Linda started tacking Bally up. Meanwhile, the sky was getting blacker and blacker. 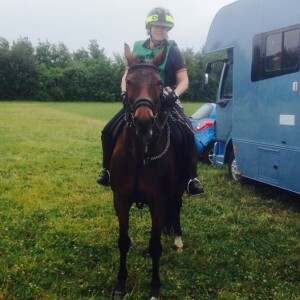 As Linda mounted the heavens opened and she headed off for her warm up in torrential rain. Nutkin was less than impressed at being left and shouted the place down. Half an hour later it was still pouring with rain, it had penetrated my coat and Nutkin looked like a drowned rat, and we now had to tack up – yuck! Nutkin and I headed down to the warm up to see Bally setting off on the course, in some of the heaviest rain, she was not impressed! The rain pretty much finished as Bally finished her round – the pair of them were drenched. Nutkin got in a right tizz in the collecting ring and just did not know what to do with himself, so thank you to all the Level 1s who were so patient with us as we reversed at high speed, or whipped sideways leaping and broncing. Anyway as soon as he was called up to the MA (control of paces) he seemed to rediscover his brain and settled right down. However, after the performance in the collecting ring I opted for safety and just trotted the canter section of the MA, which he did very nicely. He walked back nicely too, although he did lose balance and jogged a couple of times, so no points for that phase, but he went through the timers, stayed in the corridor and did not spook at the judges, so I feel that is a good foundation to work from. So on to the PTV. Well I must say he really impressed me, he was not nappy or silly at any point on the course. He jogged the corridor, and so nearly got to the end before breaking to look at the jump, but he stayed straight and didn’t hit any poles. The maypole he behaved really well, letting me pick up the rope, walk round and replace perfectly. 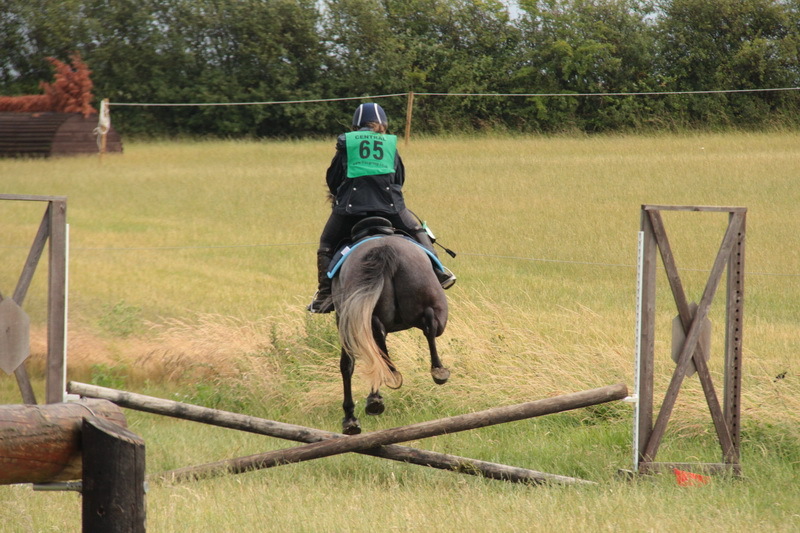 The next obstacle was the S-bend, which did not go so well, he was not sure he wanted to go near the scary cross country jump. The ditch was next, and he has never seen one of those before, so we went to look at it from a distance, but opted not to jump it until we have practised that at home. The Keysoe Keyhole was a novel obstacle for this event, a large sunken road cross country jump that you had to walk (or trot) into down the escape ramp, turn a circle one handed round a cone placed in the middle and then exit the way you came in. Well one handed was never going to work for this as he is a wobbly baby at the best of times, but I am pleased to say that when asked to do it with both hands on the reins to provide extra guidance he walked in and round very politely. No points, but a useful schooling exercise. The next obstacle was a little cross rail. We only did our first jump together on Monday, so this was a big ask for him, but you know what he tried, he put in a huge, slightly ungainly leap, but got to the other side. We then trotted up the hill to the ridden immobility, where he stood nicely to start, but gradually wandered out. 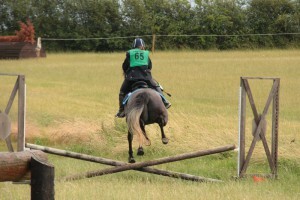 Rein back, well we did go backwards, but it wasn’t very straight. Onto the long track up to the water. We have never done water together and he was not sure what the question was, so we opted to miss that one and wait until we have a lead to take us through. The path crossing I was not sure what he would think of it as we haven’t done two uprights together. We trotted up and he stopped to have a look but did not say no, so I represented and was really pleased when he actually went through. It wasn’t pretty, but he tried. The figure of 8 was next and he did that nicely in walk, steering one handed in trot is something that we need a little more practice with. Next we had a little log pile to jump. We had a good look at it to start with, but then he jumped it (rather large) on the second time of asking. What a clever pony. The bending was easy in comparison to all the previous questions and he trotted through that happily. Onto the step up which he had no issues with and popped up neatly. The incline down was a bit slippery after the earlier rain, but again he was perfectly willing to give it a go at a deliberate walk. 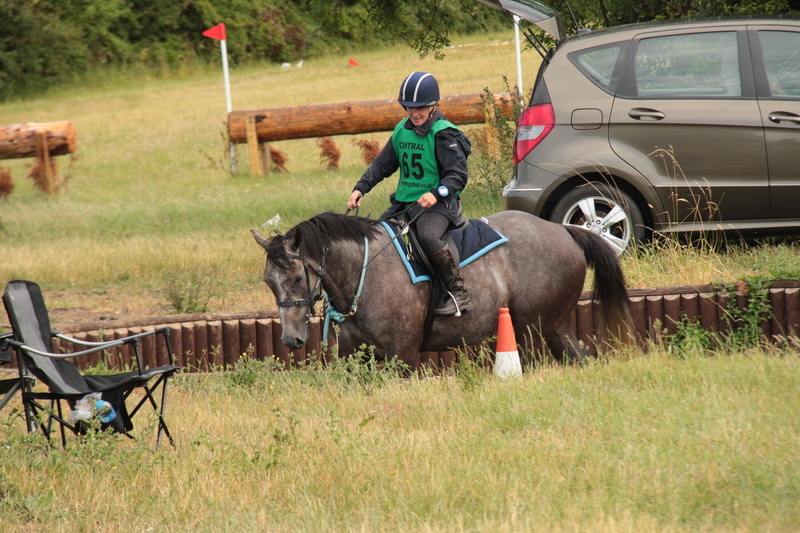 We then trotted round to the last obstacle, the clover leaf, which he trotted nicely, before doing a flying finish. It was not the fastest or best round of the day, but for a baby’s first effort I thought that it was really good, he was so genuine and tried really hard.